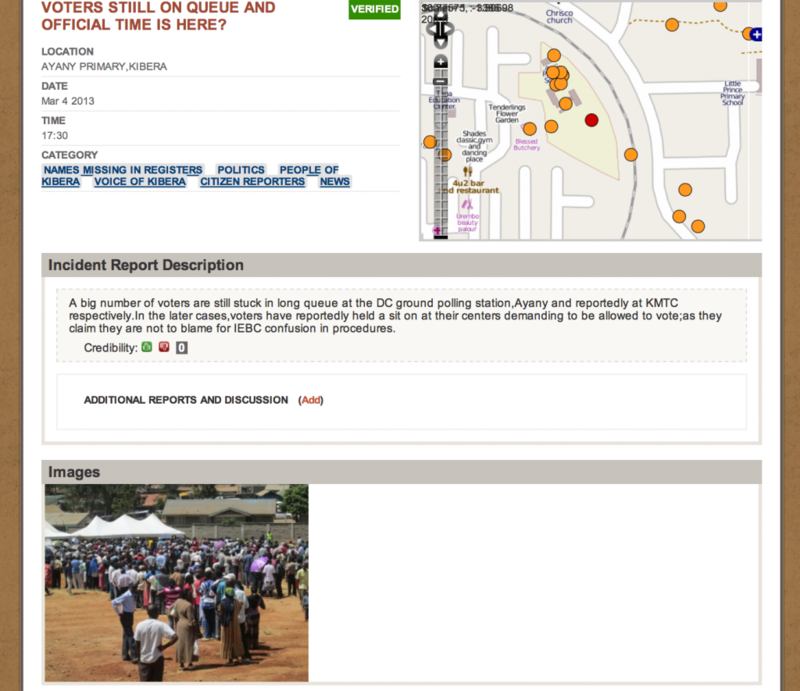 Posted on May 1, 2013 May 2, 2013 Categories Kenya, Map KiberaLeave a comment on Citizen election reporting in Kenya: A failure of technology duplication, or a breakthrough in online-offline collaboration? In fact, an idea the Map Kibera team had was to create a directory of organizations and projects in the area where each group could have a page explaining what they do. The neutral nature of this project would invite in organizations in order to allow people to know who’s doing what where, and basic transparency would be built in. It would also help those tiny initiatives of regular community members – the orphanages, day cares, and youth groups – without much money or tech savvy to have some visibility and essentially prove their value. Mikel and I worked on this a little bit in a different format with Grassroots Jerusalem at www.grassrootsalquds.com. We are still seeking funding to finish this platform and establish it in Nairobi. Once that’s done, I think we can rely on our dedicated team to fact-check reports and post about various initiatives, and because they’re trusted members of the community, they can retrieve detailed opinions of citizens, both positive and negative and quote them on the site.